Yup. I had a box with Atlanta 8 and NE 0, and said to my friend at that point that I was screwed. Atl would just run it, and worst case get stuffed and kick the FG. When they went into the shotgun I was expecting a shotgun draw, and when they actually dropped back to pass, we looked at each other and shrugged - it was a pretty obvious bad decision, but the only way I was still alive to win some money, so even though I was rooting for Atl, I was ok with it. It was hard to find a way for both of us to lose, but they managed it. 2 rings gift wrapped by Seattle and Atlanta. Amazing comeback. Shanahan gets rewarded with a head coaching gig for his brain dead play calling. Run, Run, Run, FG, Win. It was that simple. Or the people (like myself) who had Patriots -3 and felt dead in the water at 28-3 yet somehow pulled it off. How about how close it came to everyone getting their money back? 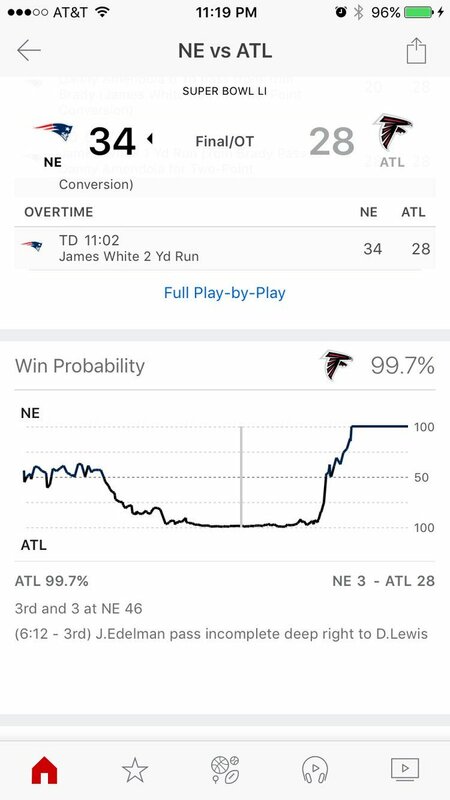 If the Pats kicked a FG in OT and then stopped Atlanta that would be a push for the spread AND the over/under. Every bet, parlay, tease that included either of those would be refunded. In my Verne Lundquist ego: "Dan Quinn. Blessed his heart, he has got to be the sickest man in America." The Pats are a public backed team, so a lot of money was wagered on them. This was particularly true during the "in game" betting. Money was coming in on the Pats during the game with live odds- at one point it was ~16-1, I heard. Plus, the public money was on OT and a 2 point conversion.